For years, the Chevy Traverse has been the quintessential mid-size SUV, and in 2019 you can expect to get everything you want and a little bit more. From impressive cargo capacity to plenty of room for friends and family, the interior of the 2019 Chevy Traverse is spacious and well designed, plus there is no shortage of creature comforts. With multiple trim levels to choose from, you can get just the right interior setup with the technology features and luxury you want. The power and performance packed under the hood of the Traverse is nothing to sneeze at either, with two different engines to choose from, depending on just how much muscle you need in your SUV. You can also choose between front-wheel drive or all-wheel drive, based on what kind of terrain you expect to encounter. Everything just comes together perfectly in terms of the Traverse’s mechanics – it is obvious that a lot of care and consideration went into the design of this beauty, inside and out. But don’t forget about safety features – the most luxurious vehicle in the world is pointless if it can’t keep you and your loved ones safe. Fortunately, the 2019 Chevy Traverse does not skimp on safety either, and there are numerous standard safety features as well as a number of optional ones to choose from. At higher trim levels these features become included, so you can easily combine sophistication and luxury with advanced technology and safety. There are only two engines available for the 2019 Chevy Traverse, but for the majority of people, that is going to be just plenty. It’s also worth noting that only one engine is available for nearly all of the trim levels available – with a second engine as an option for one specific trim setup. That can be a minor issue if you are really interested in a different configuration, but the engine available for most trims is more than enough to get the job done. 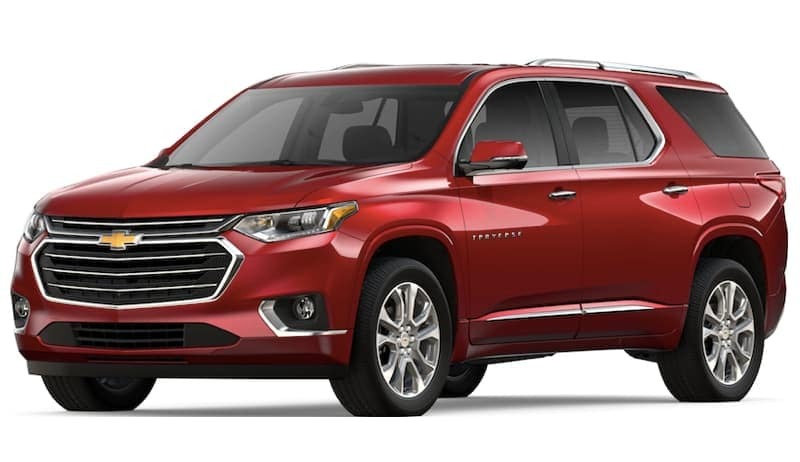 The primary engine that is available in just about every trim for the 2019 Chevy Traverse is a powerful 3.6L V6 engine that provides up to 310hp and 266 lb.-ft. of torque with variable valve timing and spark ignition direct injection. This engine includes start/stop technology that automatically shuts off the engine when the vehicle comes to a stop and the brake pedal is held, and then restarts when the brake is released. For a mid-size SUV, this should be more than enough power for most tasks you might plan on throwing at it – especially if you don’t expect to haul any heavy loads up steep inclines. For the 2019 Chevy Traverse RS trim level, with front-wheel drive, then a different engine is available and standard. This is a 2.0L Turbo 4-cylinder engine that provides up to 255hp and 295 lb.-ft. of torque. As you can see, that’s quite a bit less horsepower than the standard 3.6L V6 produces, but also quite a bit more torque. This engine also includes variable valve timing, spark ignition direct injection, and the same stop/start technology as the standard engine. We would not say one engine is particularly better than the other, as they each have certain strengths and advantages over the other. Ultimately, it depends on if you need more sustained horsepower or if you’re looking for more torque to keep you moving uphill or from a stop. It will also depend on what trim you are interested in, since only a very specific setup can even have the 2.0L Turbo engine anyway. The 2019 Chevy Traverse was clearly designed with an eye toward the practical needs of a driver – in particular, the need for storage. Most people looking for SUVs, especially a mid-size SUV, want plenty of interior storage space and room for passengers. Whether you’re a parent with a big family, just want to be able to haul a lot of friends around on a Friday night out, or need the space for camping supplies, the Traverse has you covered. There is plenty of seating for passengers, and it is arranged in a way that makes it easy to load up with passengers or cargo. At least 7 people can easily fit into the 2019 Chevy Traverse, and you can get 8 people inside if you don’t need much room for additional storage. The hands-free liftgate makes it easy to get into the back of the Traverse for loading or unloading, especially when your hands are full. The seats slide easily, so you can get people into or out of the rear of the Traverse without any fuss or hassle, and there is a hidden storage compartment at the rear of the Traverse – plus an available hidden storage compartment at the front. The seats fold down easily and create a flat, level surface that you can use to load in a lot of stuff, even long objects that would be hard pressed to fit into a lot of smaller SUVs. Fully unloaded, there is up to 98.2 cu. ft. of storage space, which means you can really cram this beauty full of whatever you need to take with you. Whether you are helping friends or family move into a home, taking a presentation with you on a Monday morning, or loading up with camping supplies and coolers for a fun weekend, the Traverse can get the job done. The 2019 Chevy Traverse is loaded with just about every technology feature and option you would expect, with a few surprises for good measure. It all centers around the beautiful 8-inch color touchscreen display at the heart of the Chevy Infotainment system. Available navigation makes this not only a great-looking feature, but also a very functional one that can help you find where you’re going and keep you on the right path. There are multiple USB ports throughout the Traverse, including ports in every row, so each passenger has access to a port without handing devices back and forth throughout the cabin. The 2019 Chevy Traverse is compatible with both Apple CarPlay and Android Auto, so no matter what platform you prefer, Chevy has you covered. The Traverse also works with the myChevrolet Mobile app that you can run on any smartphone or similar device. This app lets you monitor and communicate with your vehicle from your phone, enhancing your overall owner experience in numerous ways. When looking at a new SUV, nothing is more important than knowing that you, your friends, and your family will be safe. That is why it is so wonderful to see all the safety features packed into the 2019 Chevy Traverse as both standard and available options. This includes things like a rear-facing camera with an available rear camera mirror. Additional safety features include available forward collision alert to help prevent accidents, front pedestrian braking that stops automatically when a collision with a pedestrian is detected, and low-speed automatic braking to avoid low-speed collisions. There is also available lane departure warning and lane keep assist to help prevent wandering into another lane as well as available rear cross traffic alert and rear park assist. An available blind zone alert also helps prevent collisions by warning you when another vehicle is in your blind spot. One of the most exciting safety features on the 2019 Chevy Traverse for families with teenagers is Chevy’s Teen Driver technology. This includes a number of safety features that are tied directly to a particular key fob, which is given to a teen driver, so that these features engage when that teenager is behind the wheel. Not only does this turn on numerous safety features, like lane change alert with side blind zone alert and forward collision alert, but it also activates other things like making audio unavailable until all front-seat occupants have buckled their seat belts. There’s even an in-vehicle report card parents can access to see how their teenager has been behind the wheel, so that problem areas can be spotted and improved on, raising a new generation of safe drivers. At Carl Black Kennesaw, we don’t believe in high-pressure sales tactics or saying anything just to try to get you into a vehicle you don’t want. Time and again we have seen that the right car, truck, or SUV is out there for every driver, and our job is to help you find it. If you are interested in a mid-size SUV, then the 2019 Chevy Traverse could easily be the perfect ride for you – but words and pictures just don’t do it justice. Come to Carl Black Kennesaw and see the beautiful 2019 Chevy Traverse for yourself – sit inside it and get a feel for how it could fit into your life, and you’ll see just how fun buying a new vehicle can be.